I am well aware of being a total novice to photography. then I had better learn something about how to take a picture. There are many blogs out there with wonderful photos that are original and inspiring. Some bloggers are kind enough to share some of their processes for taking photos. There are many bloggers out there who would like to or already use photos to help tell their story. Not everyone is going to go buy photo equipment so they can take a decent blog picture. Just getting in close does not mean it is a good picture. Understand depth of field and focus as they relate to the story you want to tell. You need to practice and be able to listen to feedback. 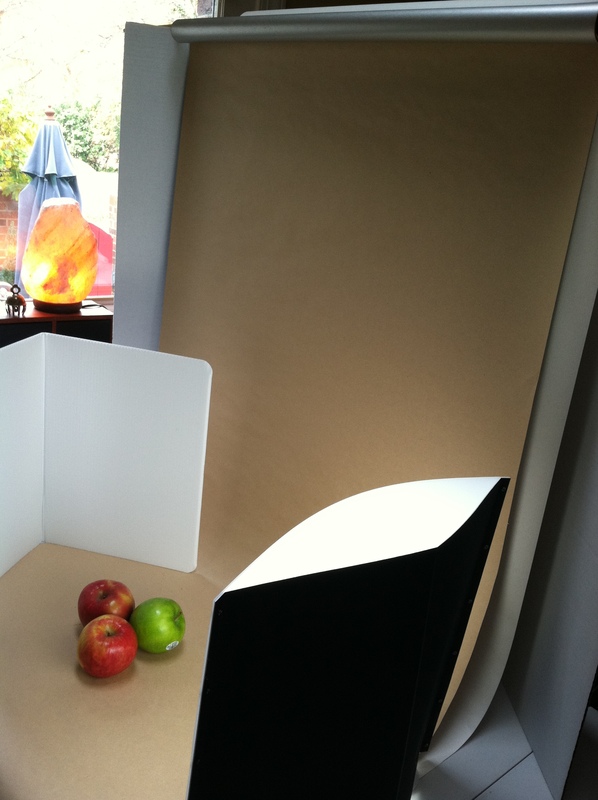 You can make an inexpensive photo studio with wrapping paper, bamboo garden stakes, straight pins and a science fair style tri-fold cardboard display and a folding table. Add a light and a reflector and you’ve got it. 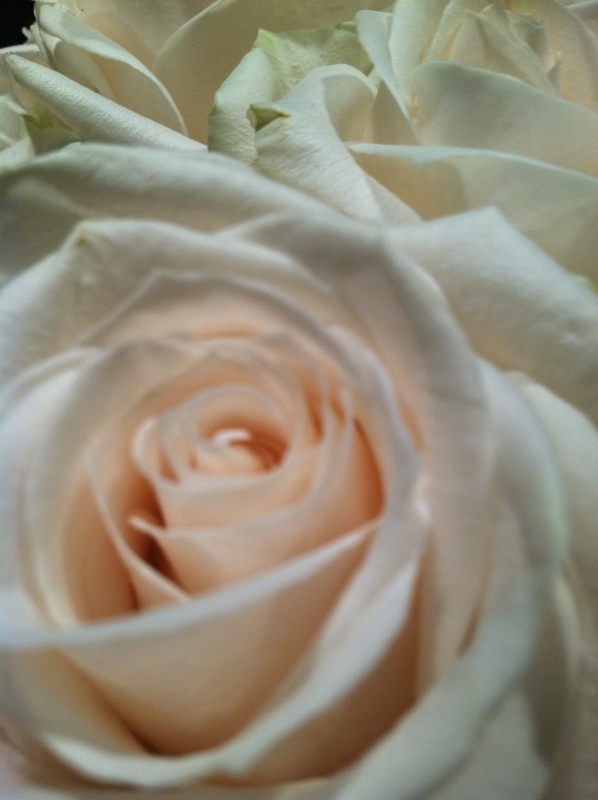 I use my i-phone 4 as my camera and an older Nikon Cool Pix 4300. Until I really can justify spending $900+ on other camera equipment, this will do. Especially for a young blog. Keep in mind, low light will produce grainy pictures. Sometime you want the grainy effect, sometimes you do not. You need to learn how to use the light available to you. Look at the difference between an overhead accent light on the counter and the photography light in the photos below. 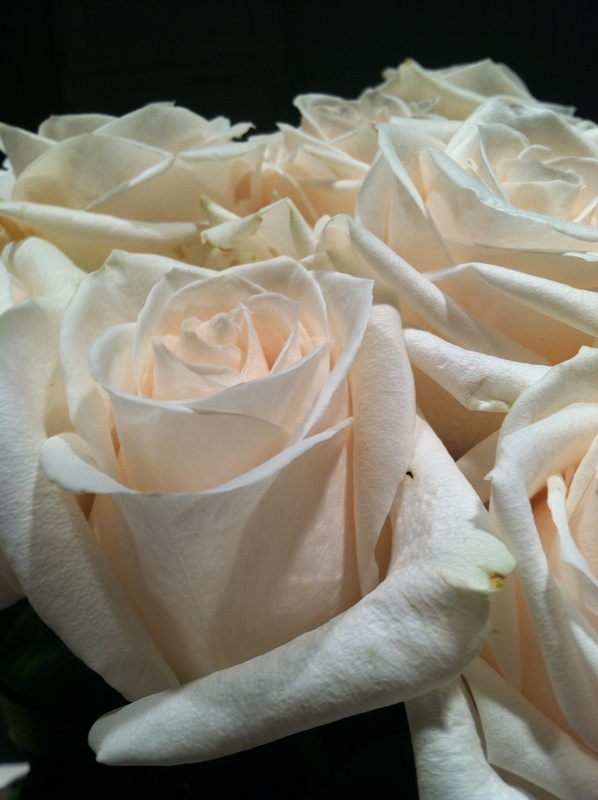 Notice how in the low light, photo 1, the roses are grainy. Pay attention to what is in the background. Notice the difference between pictures 1 and 3. 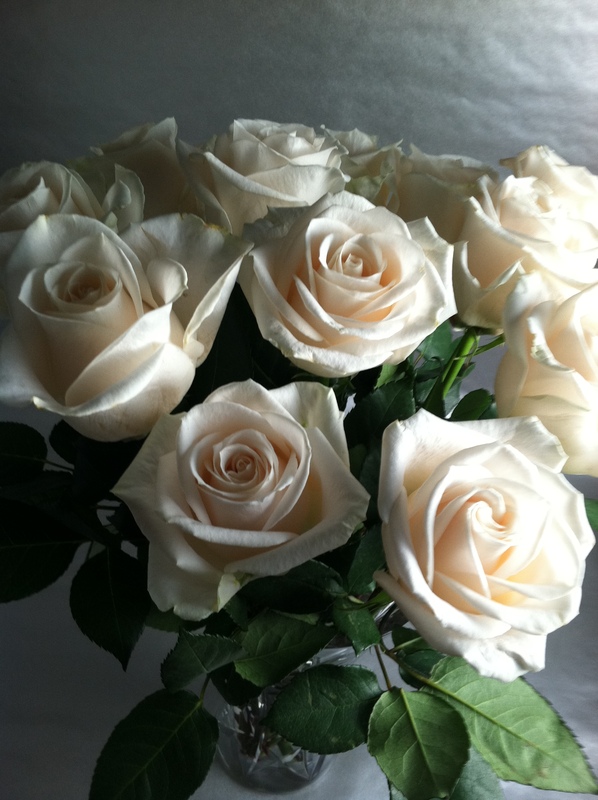 In 3, no background light, the overhead accent lights have been turned up to high.You get the idea these roses are actually white. 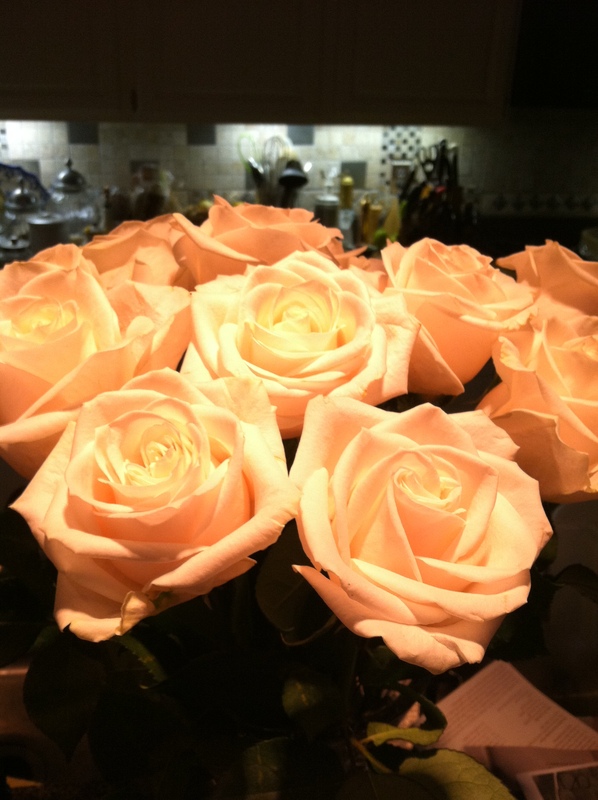 The center photo shows the same roses highlighted by the photo light. I purchased a Lowell Ego Digital imaging Light and now realize 2 lights would be very handy. You need to play with the set up and your camera angles to work out ‘hot spots’ and shadows. All of these shots need serious lighting work. The point here is to notice the difference in the kind of light you shoot and use it as a tool and skill. Now all you photo professionals out there, give me a break. I know these are not professional quality and I take them with my i-phone 4. This bit of information is for those wanting to take a picture for their blogs without huge expense. So bear with me. I am just starting to learn. Set up the tri-fold on the dining room table or a 6 ft fold out table (so it can be left up for a few days). Create the “infinity” background by draping paper across the back and curving it on the table so there is no angle where the paper meets the table, just a nice soft curve. I went to the craft store and found great colors of wrapping paper in the wedding section: silver, Kraft brown, oatmeal, and white. You can use what colors you want, I want the backgrounds to be somewhat neutral. Insert a bamboo garden stake (or a dowel) through the wrapping paper tube, place it on top of the tri-fold and pull it down to drape. 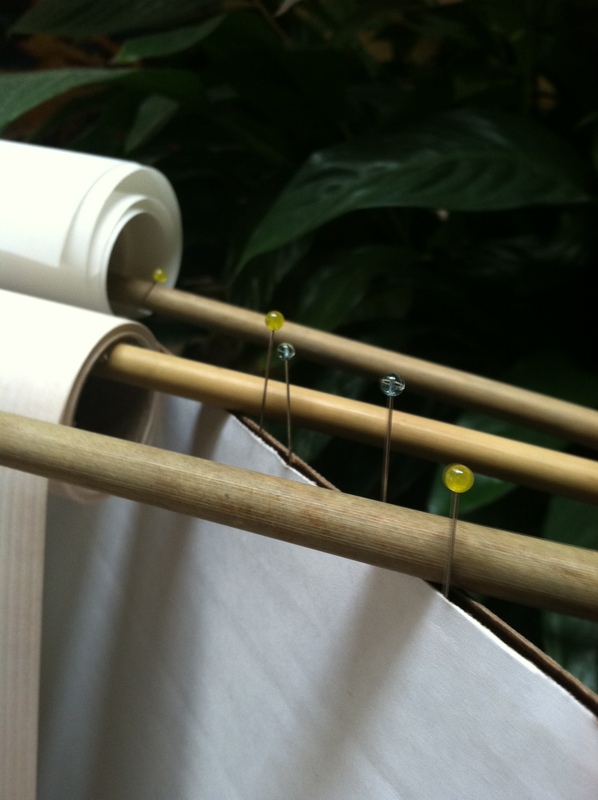 Place straight pins on either side of the dowel to hold it in place. You can make the reflector of white corrugated plastic or foam core. If you don’t have a photo light, use as much natural light as you possibly can. Notice the background, how the angle curves, everything clean. No smudges, dust or particles. 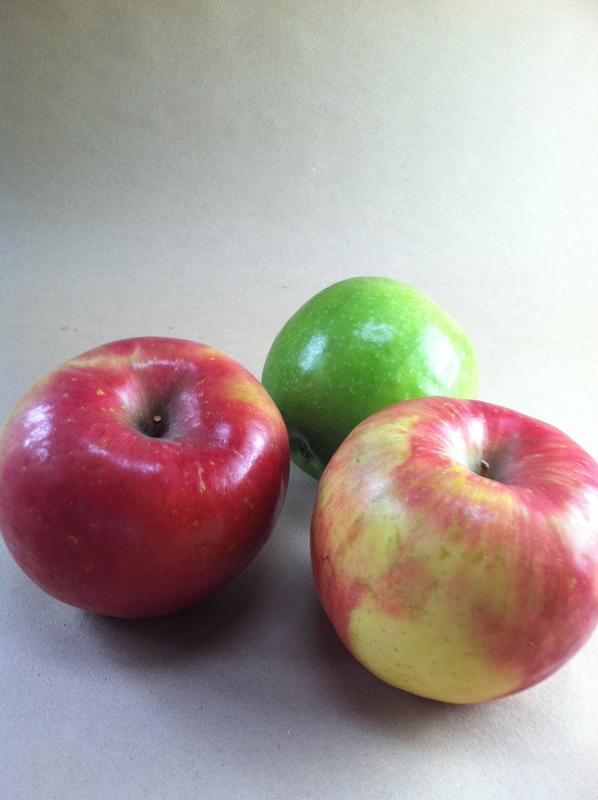 While the apples are not a perfect shot, you can see how easy it is to set up your own work area and play. You will certainly be able to improve the pictures for your blogs and tell your stories better. I hope this home-grown approach to taking blog photos helps. I find it fun to play with photography. Who knows, someday the photos will justify that camera expense. In the meantime, here is a book to read for more professional advice. 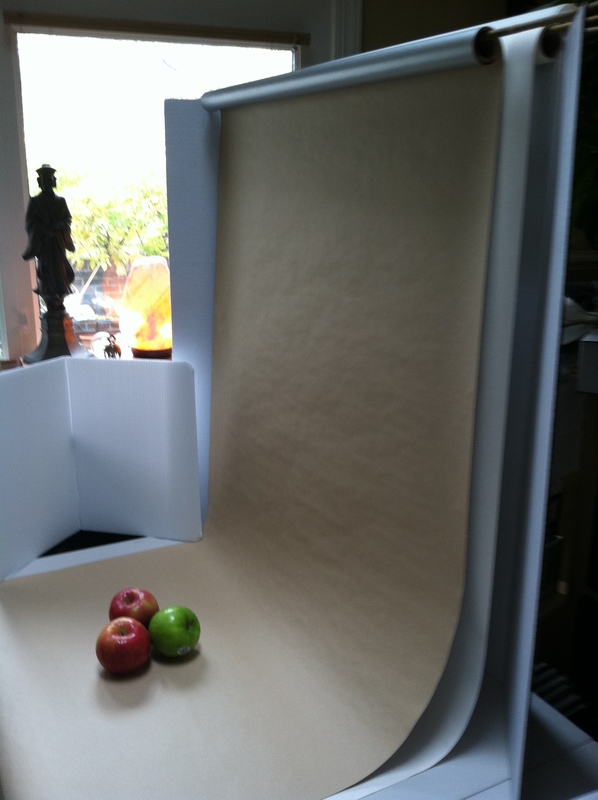 Helene Dujardin has written Plate to Pixel Digital Food Photography & Styling ISBN 978-0-470-93213-1. She has fantastic explanations of how photography works. Even with my i-phone 4 I am able to use some of the information. By the way, the focus of Helene’s book is food photography. Another book on food photography is “Food Styling The Art of Preparing Food for the Camera” by Delores Custer ISBN 978-0-470-08019-1. Have fun, share your photography journey. This is all one big learning curve! Thanks for reading this post on novice blog photography. Does anyone have a used D SLR camera for sale? Nikon, Sony or Canon? This entry was posted in Photography and tagged blog photography, food photos, i-phone 4 camera, lighting in photographs, lowell ego image lights, novice photography, taking food photos. Bookmark the permalink. Ohhh, A D90! I have been looking at these and cannot wait to buy one. And the list begins to grow: tripod, lights. . . new room on my house. I am really looking forward to learning about photography, even if it is one step at a time. Thanks for letting me know you think the camera is worth the investment. Share any other tips too!